	An, N. T.: Biological productivity of Vietnam marine waters. Monography on Vietnam seas. Hanoi: Sci. and Techn. Publ. House, 63-69 (1994). An, N. T., Son, V. D., Thu, P. M., and Huan, N. H.: Tracing Sediment Transport and Bed Regime in Nha Trang Bay. Coll. Mar. Res. Works. 10, 63–69 (2000). Andres, N. G., Witman, J. D.: Trends in Community Structure on a Jamaican Reef. Mar. Ecol. Prog. Series. 118, 305-310. (1985). Barnes, R., Hughes, R.: An Introduction to Marine Ecology; Third Edition. Malden, MA: Blackwell Scie. Inc. 117-141. (1999). Choi, D. R.: Ecological Succession of Reef Cavity-Dwellers (Coelobites) in Coral Rubble. Bull. Mar. Scie. 35(1), 72-79 (1984). Cox, E. F.: Fragmentation in the Hawaiian Coral Montipora verrucosa. In Proceeding. 7th International Coral Reef Symposium, 513–516 (1992). Dai, C. F.: Patterns of Coral Distribution and Benthic Space Partitioning on the Fringing Reefs of Southern Taiwan. Mar. Ecol. 14(3), 185-204 (1993). Dai, C. F.: Dynamics of Coral Communities, Biodiversity and the Dynamics of Ecosystems. DIWPA Ser. 1, 247–265 (1996). Davidson, O. G. The enchanted braid: coming to terms with nature on the coral reef. John Wiley & Sons, Inc., New York. (1998). Dawydoff, C.: Contribution a l’etude des invertebres de la faune marine benthiques de 1’Indochine. Bull. Biol. France Belg. Suppl. 37, 1-158. (1952). Denner, E. B. M., Smith, G., Busse, H. J. et al. : Aurantimonas coralicida gen. nov., sp. nov., the causative agent of white plague type II on Caribbean scleractinian corals. Intern. J. Sys. Evol. Microbiol. 53, 1115-1122 (2003). Ekman, S.: Zoogeography of the Sea, London: Sidgwik And Jackson, 1953. Emery, E.O., Niino, I.: Sediments of the Gulf of Thailand and Adjacent Continental Shelf, Geol. Soc. Amer. Bull. 74, 541-554 (1963). Fabricius, K. E.: Effects of irradiance, flow, and colony pigmentation on the temperature microenvironment around corals. Implications for coral bleaching? Limn. and Oceanog. 51, 30–37 (2006). Goreau, T. F., Goreau, N. I., Goreau T. J.: Corals and Coral Reefs. Scientific American. (1979). Hall, V.R. : Interspecific Differences in the Regeneration of Artificial Injuries on Scleractinian Corals. J. Exp. Mar. Biol. Ecol. 212, 9–23 (1997). Highsmith, R.C. : Passive Colonisation and Asexual Colony Multiplication in the Massive Coral Porite lutea Milne Edwards and Haime. J. Exp. Mar. Biol. Ecol. 47, 55-67 (1980). Highsmith, R.C. : Reproduction by fragmentation in corals. Mar. Ecol. Progr. Ser. 7, 207-226 (1982). Jerlov, N.G. : Optical oceanography, Elsevier: Amsterdam, 1968. Translated under the title Opticheskaya okeanografiya. Moscow: Mir, (1970). Jones, O.A., Endean, R.: Biology and geology of coral reefs, Vol. II. Nutrition of corals.. Academic Press, New York. 77-116 (1973). Ken, L.V. : Stony Corals and the Coral Reefs of Catba Islands, Marine Environment and Resources. Hanoi: Sci. Tech. Publ. House. 144-151 (1991). Latypov, Yu. Ya. : Coral Communities of the Namsu Islands (Gulf of Siam, South China Sea). Mar. Ecol. Progr. Ser. 29, 261-270 (1986). Latypov, Yu. Ya. : Community Structure of Scleractinian Reefs in the Baitylong Archipelago (South China Sea). Asian Mar. Biol. 12, 27-37 (1995). Latypov, Yu. Ya. : Benthic Communities of Coral Reefs of Tho Chu Island (Gulf of Siam, South China Sea). Biol. Morya. 25(3) 233-241 (1999). Latypov, Yu. Ya. : Macrobenthos Communities on Reefs of the An Thoi Archipelago of the South China Sea. Russian J. Mar. Biol. 26(1), 18-26 (2000). Latypov, Yu. Ya. : Coral Reef Communities of the Central Vietnam. Biol. Morya. 27, 238-241 (2001). Latypov, Yu. Ya. : Reef-Building Corals and Reefs of Vietnam: 1. The Gulf of Thailand. Russian J. Mar. Biol. 29(1), S22-S33 (2003). Latypov, Yu. Ya. : Reef-Building Corals and Reefs of Vietnam: 2. The Gulf of Tonkin. Russian J. Mar. Biol. 29,(1), S34-S45 (2003). Latypov, Yu. Ya. : Reef-Building Corals of Vietnam as a Part of the Indo-Pacific Reef Ecosystem. Russian J. Mar. Biol. 31, S34-S40 (2005). Latypov, Yu. Ya. : Variation in Composition and Structure of Coral communities of Mju and Mun Islands (Nha Trang Bay, South Chinese Sea). Biol. Morya. 32(5), 326–332 (2006). Latypov, Yu. Ya. : Coral Reefs of Vietnam. Nauka, Moscow, (2007). Latypov, Yu. Ya. : Species Composition and Distribution of Scleractinians on the Reefs of the Seychelles Islands. Russian J. Mar. Biol. 35(6), 454–462 (2009). Latypov, Yu. Ya. 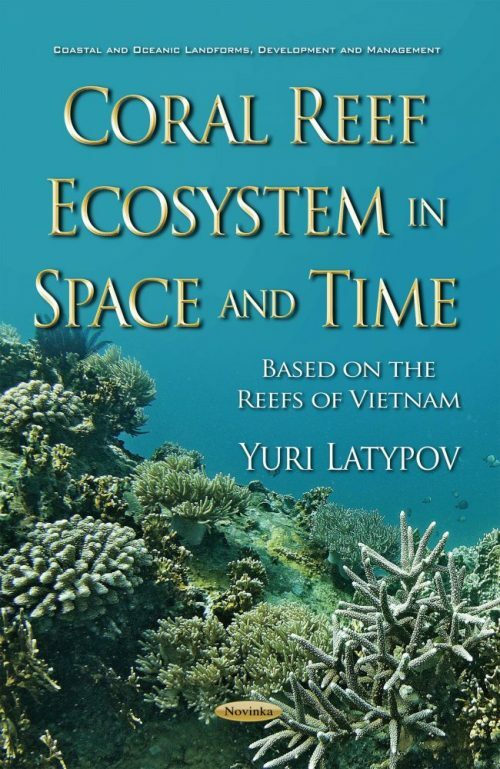 : Scleractinian Corals and Reefs of Vietnam as a Part of the Pacific Reef Ecosystem. Open J. Mar. Scie. 1, 50-68 (2011). Latypov, Yu. Ya. Spratly Archipelago as a Potential Reserve Recovery of Biodiversity in Coastal and Island Reefs of Vietnam. Mar. Sci. 2(4), 34-38 (2012). Latypov, Yu. Ya. : Barrier and Platform Reefs of the Vietnamese Coast of the South China Sea. Intern. J. Mar. Sci. 3(4), 23-32 (2013). Latypov, Yu. Ya., Selin, N.I. : Current status of coral reefs of islands in the Gulf of Siam and southern Vietnam. Russian J. Mar. Biol. 37, 246-253 (2011). Latypov, Yu. Ya., Selin, N.I. : Changes of Reef Community near Ku Lao Cham Islands (South China Sea) after Sangshen Typhoon. Amer. J. Climate Change. 1, 41-47 (2012). Latypov, Yu. Ya., Long, P.Q. : The common hard corals of Vietnam. Ministry of Agriculture and Rural Development, Hanoi. (2010). Loi, T. N.: Peuplements Animaux et Vegetaux du Substrat des Intertidal de la Baie de Nha Trang (Vietnam). Mem. Inst. Oceanog. 11, 1-236 (1967). Loya, Y.: Effects of Water Turbidity and Sedimentation on the Community Structure of Puerto Rican Corals. Bull. Mar. Sci. 26(4), 450-466 (1976). Malyutin, A.N., Latypov, Yu. Ya. : Distribution of Corals and Biogeographic Zonation of the Shelf of Vietnam. Biol. Morya. 4, 26-35 (1991). Okubo, N., Taniguchi, H., Motokawa, T.: Successful Methods for Transplanting Fragments of Acropora formosa and Acropora hyacinthus. Coral Reefs. 24, 333–342 (2005). Pastorok, R. A., Bilyard, G. R.: Effects of sewage pollution on coral-reef communities. Mar. Ecol. Prog. Ser. 21, 175-189 (1985). Pham, H.H. : Vegetation of Phu Quoc Island (Thuc Vat Dao Phu Quoc). Ho Chi Minh Publishing Co. 128-156. (1985). Picard, J.: Essai de classement des grands types de peuplements marins benthiques tropicaux, d’apres les observations effectuees dans les parages de Tulear (Sud Quest de Madagascar). Rec. Trav. Stn. Mar. Endoume, Fasc. Hors Ser. 3–24 (1967). Pichon, M.: Dynamic of Benthic Communities in the Coral Reefs of Tule’ar (Madagaskar): Succession and Transformation of the Biotops Trough Reef Tract Evolution. In: Proceeding of 2nd International Coral Reef Symposium, vol. 2, 55-68 (1974). Preobrazhensky, B.V., Latypov, Yu. Ya. : Regeneration Processes in Coral Reef Ecosystems, Biologiya koralovykh rifov. Morphologiya, systematika, ekologiya (Biology of Coral Reefs. Morphology, Systematics, Ecology), M.: Nauka. 5–12 (1980) in Russian. Sakai K. and Nishihira M., Immediate Effect of Terrestrial Runoff on a Coral Community near a River Mouth in Okinawa, Galaxea, Vol. 10, 1991, pp. 125-134. Sakai, K., Yeemin, T., Svidvong, A., Nishihira, M.: Distribution and Community Structure of Hermatypic Corals in the Sichang Islands, Inner Part of the Gulf of Thailand. Galaxea. 5(1), 27-74 (1986). Salvat, B.: Dredging in Coral Reefs, In: B. Salvat, Ed., Human Impact on Coral Reefs: Facts and Recommendations, Museum National D’histoire Naturelle et École Pratique des Hautes études, Antenne de Tahiti & Centre de l’Environnement, California. 165-184 (1987). Sѐrene, R.: Inventaires des invertebres marine de 1’Indochine. Inst. Oceanogr. Indochine. 30, 3-83 (1937). Smith, L.D., Hughes, T.P. : An Experimental Assessment of Survival, Re-Attachment and Fecundity of Coral Fragments. J. Exp. Mar. Biol. Ecol. 235 147–164 (1999). Sudara, S.: The Distribution of Planctonic Hyperiids (Crustacea, Amphipoda) in the South China Sea and the relationship to the Distribution in the Gulf of Thailand. In Proceeding III CSK Symposium, Bangkok, Thailand. Hydrogr. Dep. Press. 293-314 (1973). Sumich, J. L.: An Introduction to the Biology of Marine Life; Sixth Edition. Dubuque, IA: Wm. C. Brown. 255-269 (1996). Thanh, T. D.: Change in Environment and Ecosystems Relative to the Land-Sea Interaction in the Vietnam Coastal Zone. Reports EALOICZ Workshop, Qingdao. 1-10 (1999). Titlyanov, E.A., Latypov, Y.Y. : Light-Dependence in Scleractinian Distribution in the Sublittoral Zone of South China Sea Islands. Coral Reefs. 10, 133-138 (1991). Tomascik, T., Sander, F.: Effect of Eutrophication on Reef-Building Corals. 3. Reproduction of the Reef-Building Coral Porites porites. Mar. Biol. 94(1), 77-94 (1987). Uda, I., Nakao, T.: Water Masses and Currents in the South China Sea and Their Seasonal Changes. In Proceeding III CSK Symposium. Bangkok, Thailand. Hydrogr. Dep. Press. 161-168 (1973). Veron, J. E. N.: Corals in Space and Time: The Biogeography and Evolution of the Scleractinia. Cornell University Press, New York, 1995. Veron, J.E.N. and Hodgson, G., Annotated Checklist of the Hermatypic Corals of the Philippines, Pacif. Sci. 43, 234-287 (1989). Vo, S.T., De Vantier, L., Long, N.V., et al. : Coral Reefs of the Hon Mun Marine Protected Area, Nha Trang Bay, Vietnam, 2002: Species Composition, Community Structure, Status and Management Recommendation. In Proceeding of Science Conference. Bien Dong-2002, Nhatrang, Vietnam. 650–690 (2002). Vo, S.T., Yet, N.H., Alino, P.M.: Coral and Coral Reefs in the North of Spratly Archipelago – The Results of RP-VN JOMSRE-SCS 1996. In Proceeding Science Conference. RP-VN JOMSRE-SCS 96, Hanoi, 22–23 April. 87–101 (1997). WWF. : Vietnam Marine Conservation Southern Survey Team. Survey Report on the Biodiversity Resource Utilization and Conservation Potential of Coto Islands, Quangninh Province, N. Vietnam, Gland, Switzerland, (1994). Yet, N.H.: Thánm phán loái hô cúng và cáu trúc ran san hô Dâo Thuyên Chài (Quân Dâo Truòng Sa), Tai nguyên và mô i truong biên. Hanoi, l(IV), 299–313 (1997). Yet, N.H., Ken, L.V. : Some Data on Species Composition and Distribution of Scleractinian Corals in Ha Long Bay. J. Biol. (Hanoi). 18, 7-13 (1996).